The Single Month Billing Summary report shows statistics on your bill taken directly from your cloud provider invoice for each day for a specific month. 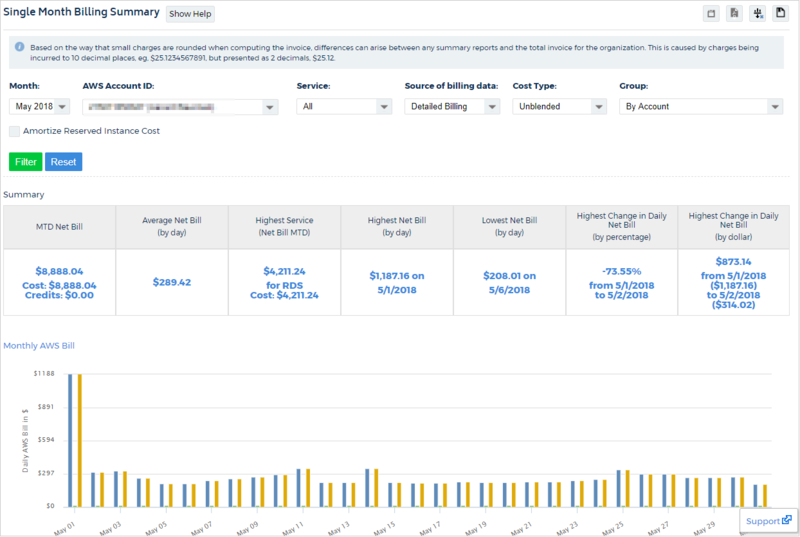 To access the report and see an overview of those costs, go to the left navigation pane and choose Cost > AWS Billing > Summary Report > Monthly. The report displays metrics and a visual for a month and highlights your biggest spend by service and by day, as well as the biggest change. You can also choose any of the drop-down options to filter by accounts, cost types, services, or to group the data in a different way. Now you can use the CloudCheckr Cost Alert features to be notified when your spend changes in ways you don't want.